For three days straight over this weekend, we did our favorite thing- we had friends over for a meal at our home. This is fun year round but especially enjoyable when the weather turns chilly, when it is too cold and dark to spend time outside. That's when the warm kitchen is the place to be. The festivities started on Friday, Lila had a day off from school for Fall break (following a day of prancing around as a rainbow for Halloween). We invited her two best friends from school over for a play date followed by lunch. Kids fought, played, yelled, giggled, sometimes all at once, while I got a chance to get to know their parents who I normally just wave to in the school's parking lot. At Lila's request, lunch was mac and cheese and a tray of roasted broccoli and sweet potatoes. With apple and yellow pepper slices for snack and mixed berries for dessert. I used Martha Stewart's recipe for the mac and cheese (I had pinned it from this post some years ago) with a few modifications: I scaled down the recipe to a 12 oz box of "white fiber" spiral pasta, used less cheese- and used cheddar, pepper jack, Parmesan and cream cheese instead of the ones mentioned in the recipe. It is a wonderful recipe, makes a large batch and reheats beautifully. On Saturday, my crafting buddies came over to sew and knit, and I made them a supper of broccoli cheese soup and caramalized onion- lentil pilaf. A friend got peanut butter bars for dessert. Then on Sunday, I made a meal for friends of ours who love Indian food. I think they would burst into tears of disappointment if I ever served them mac and cheese. For them, I made some of our all-time favorites- chana masala, jeera rice, cabbage raita, egg kebab and one sort-of new recipe, stuffed eggplant curry. This recipe started with some fresh and tender Japanese eggplants (the slender, long ones) from the Asian store. I have much better luck with this variety being sweet and tender, compared to globe (Italian) eggplants or the baby Indian ones. Then I was inspired by Meera's recipe and this one originally from Indira. The idea was to make a thick paste for stuffing- with herbs, spices, nuts and contrasting flavors of jaggery and tamarind. Then to fill it into eggplant sections, and finally to pressure cook the eggplants with a bit of coconut milk (which forms the gravy) because pressure cooking gives evenly cooked eggplants reliably and effortlessly. 1. Wash 4 Japanese eggplants. Remove and discard stem. Cut each eggplant into 3 or 4 sections. Make a deep lengthwise slit in each eggplant piece. The stuffing should be a thick paste- taste it and make sure it has a good balance of flavors. Fill it into the eggplant sections using a tablespoon. 3. Heat 1 tbsp. oil in a pressure cooker. Temper it with 1 tsp. mustard seeds, asafetida and turmeric. 4. Stack the stuffed eggplant neatly in the cooker. If you have a wide pressure pan, that would be ideal. I only have a handi-shaped cooker and it worked fine. 5. Pour 1/2 cup coconut milk + 1/2 cup water over the eggplants. Close the pressure cooker and let it cook. I barely let the cooker come up to full pressure before turning off the heat. Eggplants cook quickly and I did not want them to collapse into an overcooked paste. 6. Remove the eggplants into a serving dish. Top them with the thick gravy. Serve! Edited to add: A few readers requested the recipe for the cabbage raita. Here it is, easy as can be. What have you been cooking these days? What a wonderful weekend you have had. I saw the outfit on your craft blog and it looks so cute! and Thomas too.. Wow! We had a Halloween Party too with S's friends coming over. It was a lot of fun! Your party looks like so much fun- that's something I would like to do once Lila is older and understands more of Halloween and other holidays. Just one word for the all the delicacies you have made: YUM! I don't get stressed out by guests- nothing has to pristine or perfect, it is all casual and they know it. We run the vacuum cleaner and that's about the extent of cleaning. I happen to be an early bird so cooking is not a big deal- I cook things the day of. And if I'm short on time, I'll get something store bought. For instance, at the end of our Indian dinner, we had ice cream from the store. My point is: I do what I can without getting stressed out. The point is to enjoy the process. 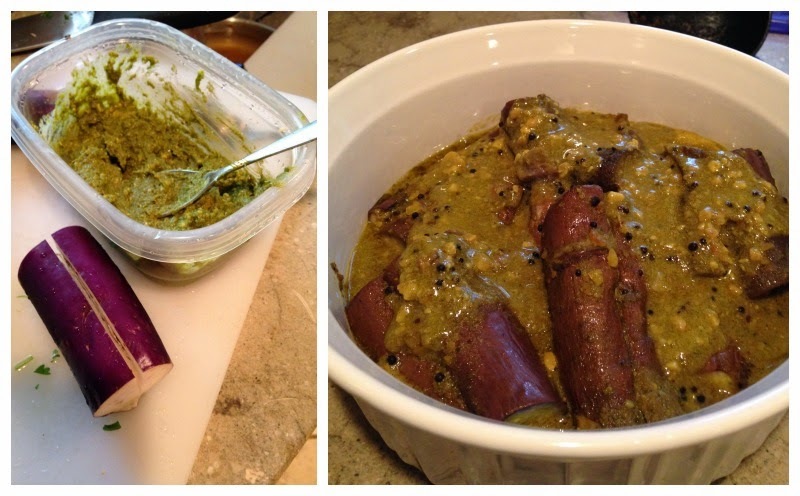 Sometime back I mixed two traditional recipes for stuffed eggplant (South Indian + Maharashtrian) and made stuffed tori for the first time. That turned out very well. Try your recipe with zucchini and see what you think of that. Well, I don't like undercooked eggplant and pressure cooking gets them cooked so uniformly that it is becoming my method of choice. Just don't keep the pressure on for too long! Tori- is that dodka/ridge gourd. I'll have to try that! Sounds like a lovely time!! Would you mind sharing the recipe for the pilaf - that sounds like a great dish? except that I cooked and cooled rice ahead of time. Then caramelized onions in olive oil, added soaked lentils and a bit of water, covered and cooked until lentils were tender and stirred in the rice and herbs. How I would LOVE to come to your house for dinner! Nothing to it. But I will post it. I love cabbage raita! We make it with lemon, crushed peanuts, cilantro and chillies (no yogurt)..
That sounds great! I can see how pumpkin would add color and moisture to baked goods! Same way zucchini or carrot do, I guess. Stuffed eggplants is one of my favorite dishes. Will have to try your version sometime. Oh my mom makes baby eggplants the same way and calls it bharli vangi. The only variation is that there is more jaggery making the final dish on the sweeter side. And we add fresh coconut and coriander to garnish. I, however, have an inbuilt dislike for eggplants. The only way I will eat them is if someone makes me a 'bhareet' with the eggplant roasted on a coal fire. How do you make cabbage raita? Is the cabbage cooked or raw? Every family seems to have a variation and they are all so good! Cabbage was raw in the raita. That sounds like quite a weekend and a warm kitchen filled with laughter and chattering ... who will say no to that? The eggplant recipe sounds yum . I had made some undhiyo paste on Monday so maybe I will try cooking eggplants in the pressure cooker with the paste . Did you keep the pressure cooker on low or medium heat while cooking the eggplants ? Undhiyo paste! That would be excellent with eggplants. I always pressure cook on high heat. With this recipe, I took the cooker off heat as soon as it built pressure because it is an efficient one and I didn't want the eggplant turning to mush. Thanks for the quick response :) off to the store to stock up on eggplants to make it next week. Cabbage raita? Never heard of this one! I'm joining in the requests for the recipe, please! It started snowing already?! I really wish you'd make a road trip and come see us here in warmer climes :) And yes, I'll stuff you silly with homemade khaana. I have not used Japanese eggplants much. Bought them yesterday, and you are right - they are so much better than the Indian or Italian variety. No black seeds or hard flesh. Yup, that's what I find so I tend to buy those now.